Every New Years I make a few resolutions. I make promises to myself to do this, don’t do that, accomplish this and forget about that. And although I create them with good intentions, I sometimes lack the discipline needed to see them through to the next year. So this year I plan to take the pressure off of myself. I don’t think I will be making any new monumental resolutions. But before the clock strikes 12:00 AM on January 1, 2012, here are seven things I plan to have accomplished. Gotta get myself ready for a fantastic year ahead. 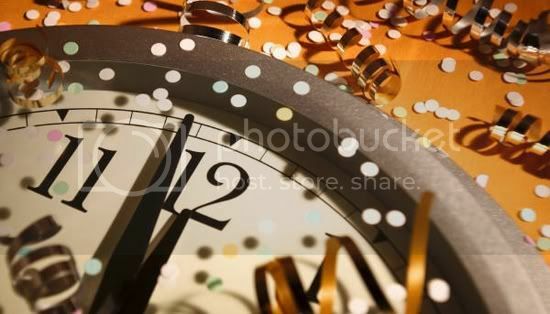 Will you be making any resolutions for 2012? Cheers to a prosperous New Year ahead and making the impossible possible! ...and now that all the Christmas fun has ended, it's time to prepare for the New Year! I hope everyone's Christmas was just as awesome as mine. 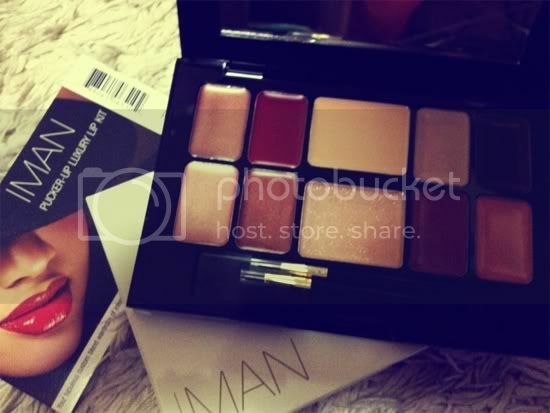 As promised I am giving away this super cute Iman "Pucker Up Luxury Lip Kit" just in time for the holiday season. And since it's not yet available, here's your chance to win one! 1. 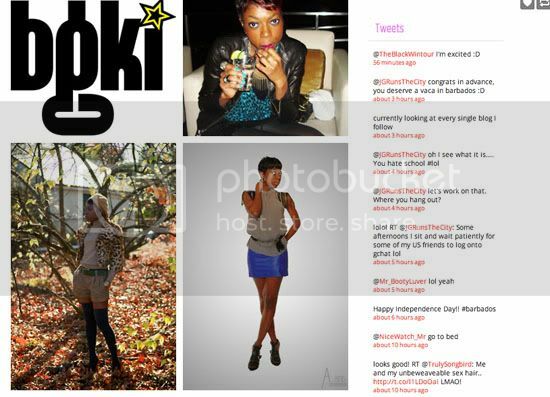 Follow me on twitter @TheFabChick or "Like" TheFabChick on Facebook here. 2. Leave a comment telling me what's your favorite lip color to pucker up with. Be sure to include your twitter or facebook name with you comment. ENTER NOW!! The winner will be chosen at random on Christmas day. Now how about that for a little after Christmas gifting. 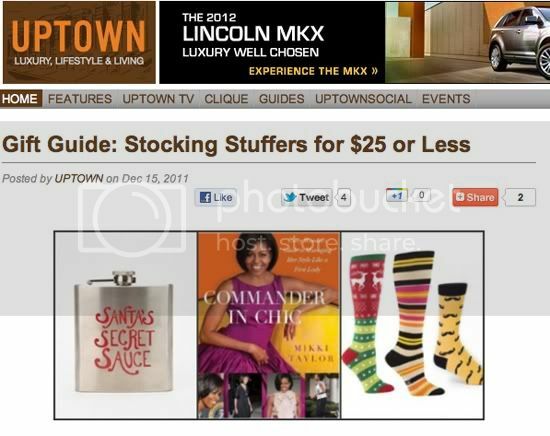 And if you're like myself, you love getting Christmas gifts after the day as well! 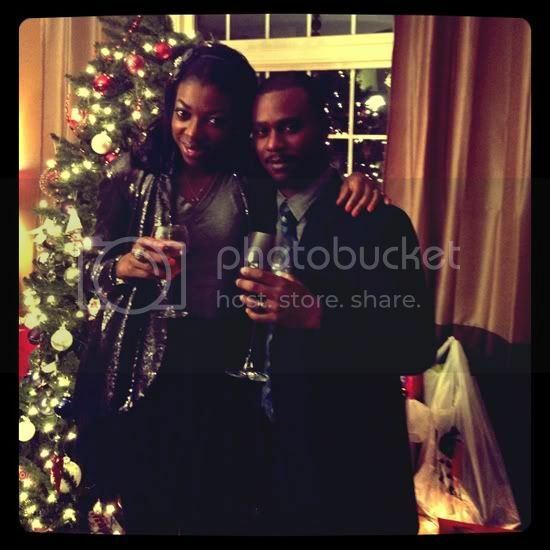 This weekend I celebrated the holidays with my bestie and writer Shydel at his annual Christmas party! Fun...fun...and more fun. He really knows how to throw a chic party! This installment of "My Weekend in Instagram" is dedicated to a long standing friendship I've had with a guy who's always been an inspiration in my life. As we get ready to close out the year, I strongly urge you to surround yourself with friends who will constantly push and motivate you towards greatness. And when you can find friends that lead by example, it's pure awesomeness! For over a year now I’ve been committed to drinking HOT water daily. I start my day with a cup of hot water. Yes I know you’ve seen my daily foursquare check-ins at Starbucks, but before and sometimes after my caffeine fix I consume a cup of hot water. Of course we all know the benefits of drinking water, but ever since my mom called to tell me about an episode of Dr. Oz where he recommended drinking hot water, I’ve been hooked. Here’s a small list why I’m all about drinking hot water in the midst of my normal water intake. 1. 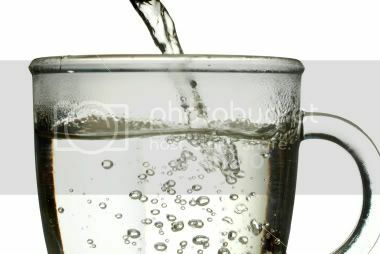 Drinking hot water can be like spending time in a sauna, it purifies your body. As your body temperature rises and you begin to perspire, hot water flushes the toxins out. Add a piece of lemon first thing in the morning and it can assist in daily cleansing—helping prevent constipation. 2. I suffer from sinus and nasal congestion, especially when the air is dry. Drinking hot water helps in clearing your nasal cavity, relieving congestion and sinus pressure. 3. Drinking hot water is a great way to stay hydrated and keep warm. You might say, why not drink tea? Consuming tea with caffeine may keep you alert and warm, but it doesn’t help in hydration. The caffeine element is what can cause dehydration. 4. Hot water can improve your digestion, especially after meals. Drinking cold beverages/water during and immediately after a meal can be dangerous. (I remember my father scolding me about this, giving me an example of what happens when you mix cold water and oil.) Think about it. Drinking cold water solidifies the oil in the foods you consume—harmful for digestion. This can cause the oil in your food to breakdown faster than the solid food you’ve consumed. This lines the intestines turning into fats and possibly cancer. 5. Blood circulation is improved by drinking hot water. 6. And again with some lemon first thing in the morning, hot water is great for getting the metabolism going—perfect as a weight loss strategy. 7. Just as drinking water in general is important to maintaining healthy skin, hot water is excellent for your complexion as well! Try drinking a daily cup of hot water. Add lemon or natural honey for flavoring if necessary as they both are good for you. And be sure to boil your water and not consume hot tap water. Your hot water should be just as clean as any temperature water you drink. 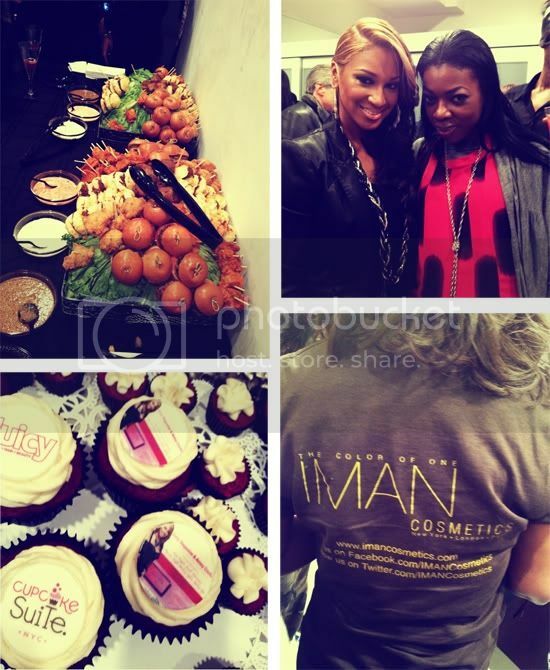 OUT & ABOUT | Juicy Magazine Holiday Glam Event - Late Nights, Early Mornings"
In the spirit of the holiday season, Juicy Magazine along with Iman Cosmetics and AMOY Couture Hair held a holiday glam event hosted by recording artist and VH1's Love and Hip Hop's, Olivia. The soiree took place at the upper east side AMOY Couture Salon where invited media guests enjoyed tasty Alizé cocktails, yummy cupcakes by Get 'Em Girls and delicious appetizers (with the best spicy mustard I've ever tasted) while receiving hair and makeup styling tips with Iman cosmetics. Some others in attendance; Yandy Smith and singer Teairra Mari also of Love and Hip Hop, as well as Project Runway's Kimberly Goldson and more. Stay tuned as I will be giving away this super cute holiday inspired "Pucker Up Luxury Lip Kit" just in time to give yourself the perfect holiday pout. It’s holiday party time! Are you ready to entertain your guests? Aside from putting together a flawless and festive look, will your party menu shine just as bright as your sequined mini and tree lights? First things first, let’s get the drinks flowing right! What better way to get your guests in the holiday spirit than with a few tasty and festive spirits of your own? 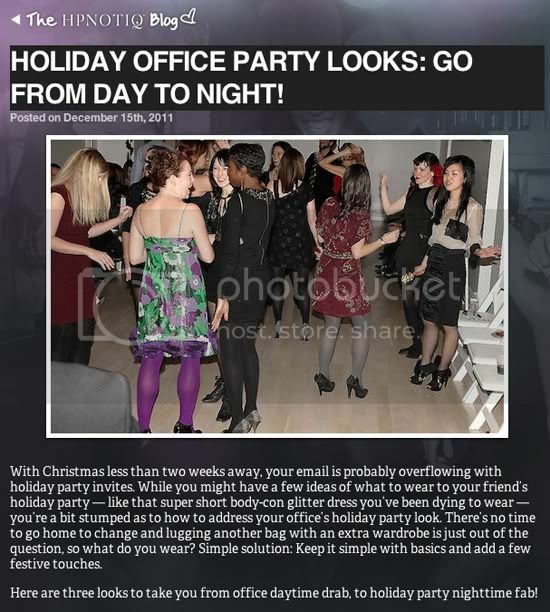 So I asked fab chick and mixologist LaToya Allen for a few creative and delicious cocktail recipes that will be perfect for an elaborate holiday party or simple gathering. She’s got us covered with 3 holiday cocktail options! The Situation: You’re hosting a Christmas party. While you may have options for beer, wine and basic mixed drinks it’s always a good idea to have at least one holiday themed cocktail. First it’s important to slap the sage leaves a bit. This helps to release their oils. Drop them into the bottom of a shaker, adding all ingredients and ice. Shake well and strain into two cocktail glasses. Garnish with a few sage leaves and cranberries, to your liking. The Situation: The weather outside is frightful. You’ve invited a few girlfriends over to watch your favorite chick flick, talk men and exchange gifts while enjoying cocktails by the fire—or if your in the city, a space heater. Pour the rum, chocolate liqueur and milk into a small pot. Add the chili pepper slices, brown sugar and a dash of cinnamon. Simmer on low until hot but not to boil. Strain the mixture into your favorite mugs and top with a bit of whipped cream. The Situation: You’re hosting a New Years Eve bash. While guests may be enjoying their cocktail of choice for the evening, it’s tradition to serve champagne for the midnight toast. Here’s a nice champagne cocktail alternative. Add Grand Marnier, cranberry juice and passion fruit juice to a shaker and fill with ice. Shake well. Strain into two separate champagne flutes. Top with champagne. Happy holidays and happy drinking! As always please drink and serve responsibly. For more fab cocktail ideas visit LaToya over on fashionandcocktails.tumblr.com and follow her on twitter: @Fashn_Cocktails. Cheers to a fab holiday season and New Year! 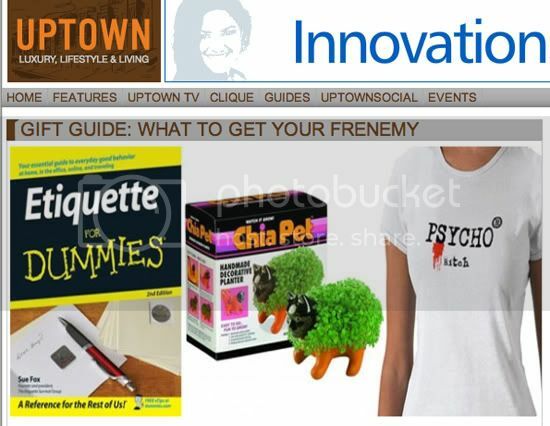 Head over to Uptown Magazine to check out my complete gift guide for items to give that "friend" who just isn't quite a friend in your life. Let me know what you think of my ideas! As a long time fan of the Free People brand, I always look forward to receiving their monthly catalogs--falling in love with many of the pieces and styling. 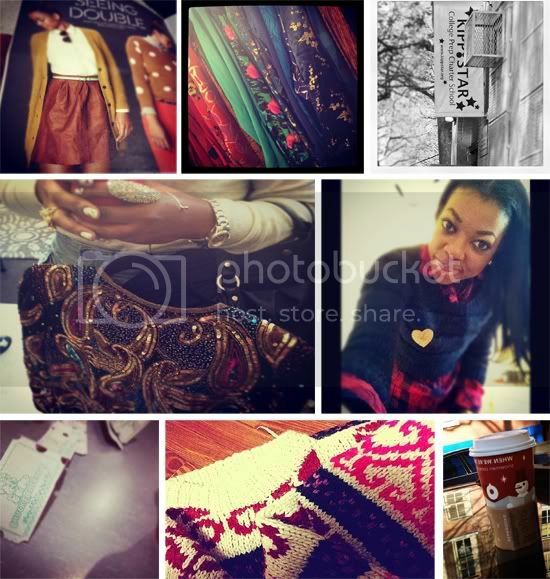 Last month I loved the layering and knitwear. 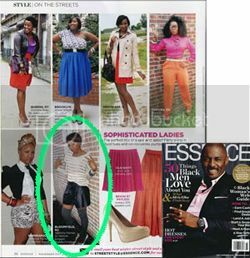 For the December 2011 issue, my love for all things leather increased. Just check out these cobalt blue leather pants...Love! 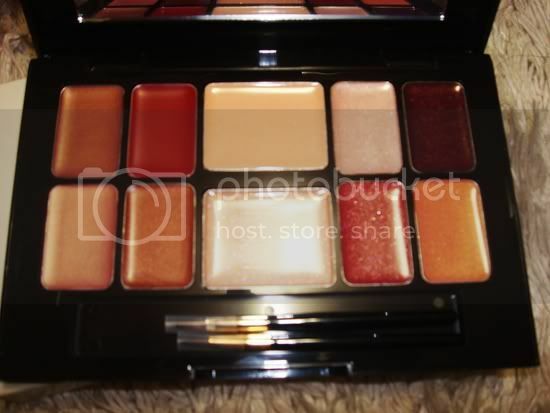 Here are a few of my favs from the December 2011 catalog. Aside from sequins, lamé and other fabrics that shimmer and shine, velvet is another great textured fabric that can be perfect for holiday dressing. It is also a great fabric for adding texture to your everyday look --creating a little more dimension to your go-to denims and wools during the cold season. 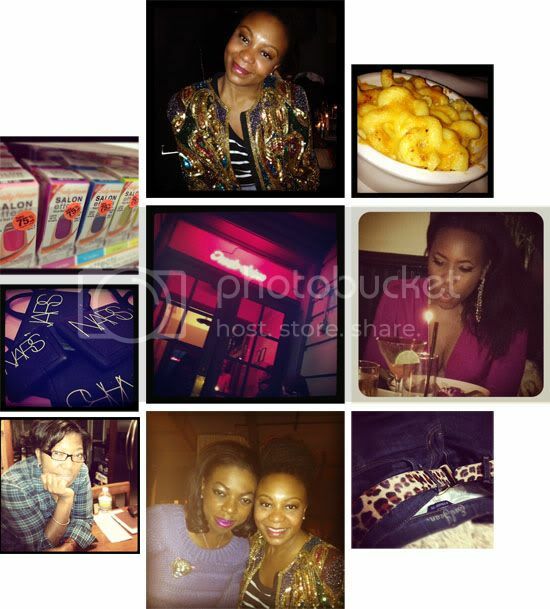 Birthdays, friends, family, food, drinks and a little randomness in between. Mikki Taylor’s Commander in Chic speaks to the kind of woman I aspire to be—chic, poised, refined and fab in all dimensions of life. 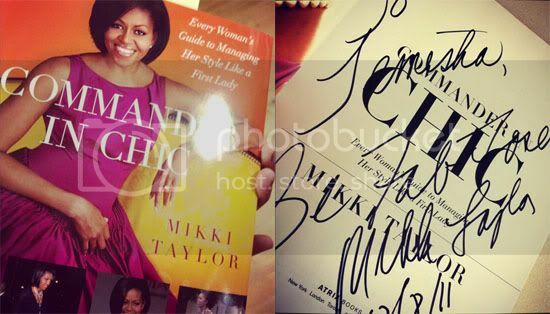 And while Ms. Taylor exudes all those things herself, her use of our first lady Michelle Obama as her muse makes a very compelling statement as the book’s subject. 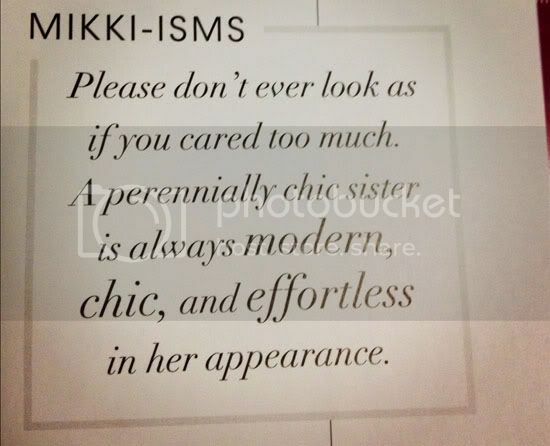 It’s an easy to read, step-by-step guide filled with tips, inspirational messages (Mikki calls Mikkisms) and how-to’s for those looking to enhance their personal style. 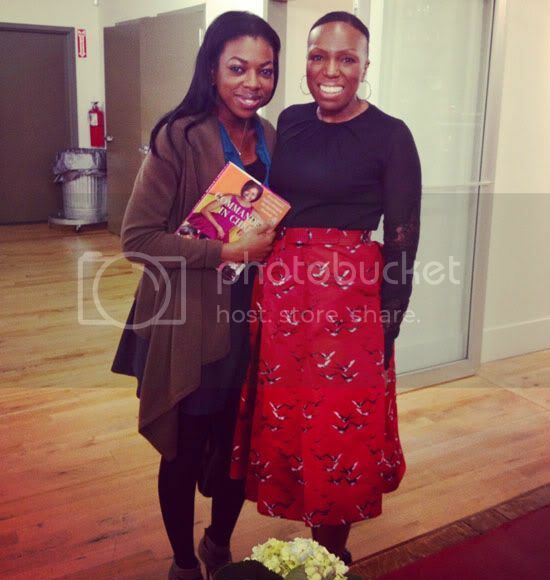 Attending last night’s private book signing at the Bobbi Brown Studios in Montclair, New Jersey afforded me the chance to finally meet Mikki Taylor after being in the same venue as her numerous times. I can’t tell you how many times I’ve seen her at fashion shows and exchanges smiles without so much as a hello. Mission finally accomplished! 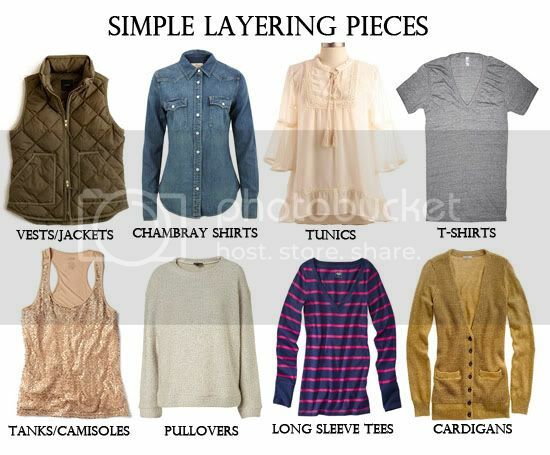 Layering is not always an easy task. 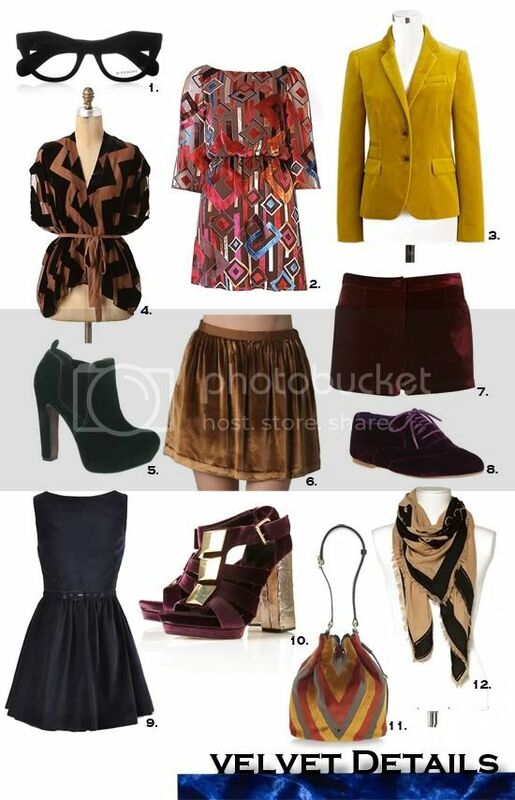 It can be very difficult to create an outfit that allows you to maximize your wardrobe in one complete look. I love to layer my clothing. Not just during the cold months, but I find myself wearing multiple layers year round. For me, it’s a great way to add depth to my look. I like to consider each layer (or article of clothing) as an ingredient for building my personal style recipe for the day. While this may be challenging for many, I’ve come up with 5 tips for you to keep in mind when layering your clothing. 1. Build your look from the inside out. Always start creating your layers from the bottom up until you become a pro. 2. Start with lighter weight fabrics and items on the bottom layer. As you build, your top layer should be of a heavier fabric. 3. Don’t be afraid to play with proportions to create new and interesting silhouettes, hemlines and sleeve lengths. 4. Be adventurous with color and textures. Don’t be afraid to mesh contrasting colors and textures together in one look. Be bold! 5. Equip your wardrobe with easy no-brainer layering items: vests, pullovers and cardigans. Shop for easy to layer items and you’ll be layering like a pro in no time. 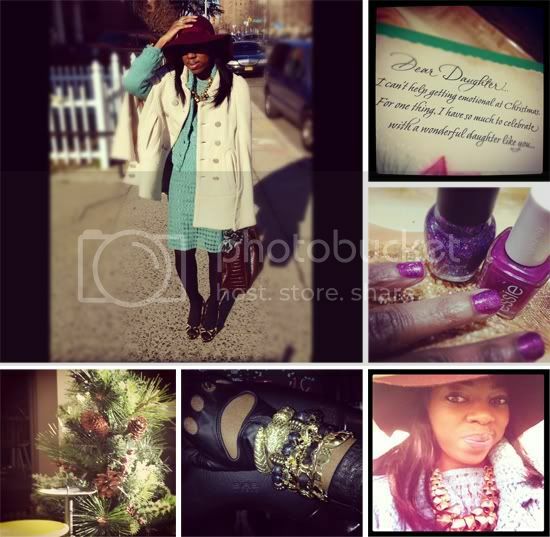 Placing a style on my radar is as simple as me falling in love with just one cool item. 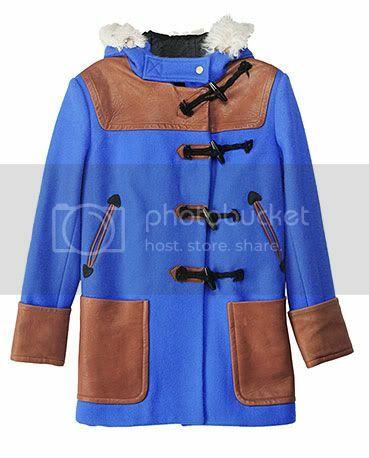 Currently I am all about this Rag and Bone royal blue duffle coat with leather trim. What I love about it? 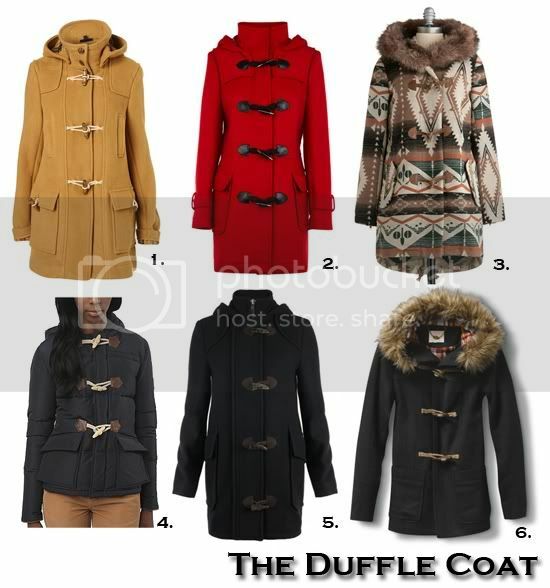 It is created in a traditional British duffle coat style with toggle buttons and front patch pockets but with cool unexpected non-traditional elements—a bright color and luxe details and trims—which makes it that more special. This weekend I added things to my list of wants, (stay tuned for that massive list) mentored a 13 yr old young lady, vintage shopped with Annika, partied it up at Chuck E. Cheese, (oh what fun, not) wore my Naked Heart, and all not before having my daily dose of Starbucks. The members-only online shop ShoeMint has officially launched and I didn’t spare anytime making my first shoe purchase –12am November 25th to be exact. Since I fell for the wine colored wedges that co-designer Rachel Blison wore, my choice was a no-brainer. Well, I’ve received my purchase! And I’m sure all of you want to know what my thoughts are right? Well here goes. For shipping I would have to say was pretty good, standard even. I ordered on Friday, November 25th and received my purchase Thursday December 1st. I’m pleased with the amount of time it took for me to receive my purchase. Thumbs-up for shipping ShoeMint. Where style is concerned, the images on the website in comparison to what I received was pretty accurate. How many times do you order a particular style of shoe, open your package and the style and make of what you selected is very disappointing in appearance—different in texture and silhouette from what’s shown online? It can be very upsetting. Thumbs-up for style accuracy ShoeMint. My main concern and issue with ordering from many shoe sites like ShoeMint is always the quality and comfort. ShoeMint urges buyers of premium materials, expert craftsmanship, perfect fit and real leather and suede. The suede wedges I purchased actually feels and looks just like suede. There’s nothing more disheartening to me then thinking you are getting a pair of real suede shoes just to feel the texture of some micro-fiber faux-ness. As for comfort, considering the extreme height of these wedges, the platform makes it easy to walk in, but I would not suggest for all day standing –at least not for me. Thumbs-up for quality and comfort ShoeMint. So if you were skeptical like myself about ShoeMint, I can say that out of all the other members-only online shoe sites, this so far has to be the best in quality, which ranks pretty high in my book. With the debut collection selling out, I am very curious to see future selections. I’ll stay tuned and find a hiding place for wallet. 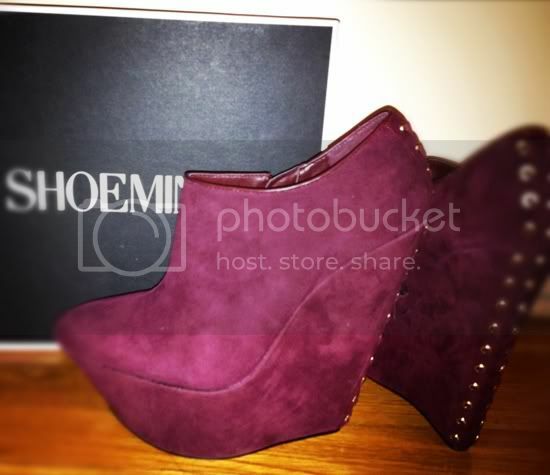 Have you signed up for ShoeMint?